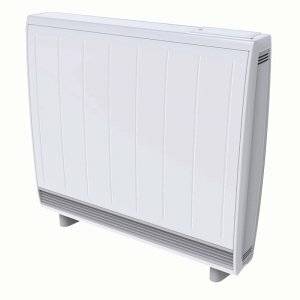 The Dimplex Quantum high heat retention storage heater is up to 27% cheaper to run and uses 22% less energy than comparable static storage heaters. Featuring exceptional insulation and very low thermal conductivity the Quantum is an exceptional economical electric heating system. Adapting to match lifestyle and climate conditions, delivering heat only when it's needed, the Quantum is the perfect upgrade for static storage heaters and suits a wide range of applications. Quantum stores energy up during periods of low demand, turning it into efficient heat only when needed. Through its use of a sophisticated self-learning algorithm, the IQ controller is able to take just the right amount of heat to match the user’s lifestyle and changing weather, intuitively and precisely. Quantum is fitted with the iQ controller so you can pre-set your heating requirements – just like central heating. Manual adjustment, if required, is also simple with its easy-to-read LCD display and user-friendly low torque rotary knob – designed with the visually impaired in mind. The Quantum heat outlet is positioned at the base of the heater, the room is heated from floor level, ensuring maximum comfort and efficiency. 10-year warranty and BEAB approved. We offer a free design service, as it is important to install the correct number of heaters to ensure your system works properly for your requirements.